The IMF's Fiscal Transparency Code is the international standard for disclosure of information about public finances and is the centrepiece of the global architecture on fiscal transparency. The Fiscal Transparency Handbook (2018) provides detailed guidance on the implementation of the Fiscal Transparency Code. Fiscal Transparency is about "the information available to the public about the government's fiscal policy-making process." It refers to the clarity, reliability, frequency, timeliness, and relevance of public fiscal reporting and the openness of such information. Fiscal reports that are easy to understand, with accurate representation of government fiscal operations and finances, published in regular cycles and timely, providing information needed to make effective decisions and open data information, are considered transparent and important. IMF's Fiscal Transparency Code sets the standard for disclosure of information about public finances, aiming to strengthen fiscal surveillance, support policy-making, and improve fiscal accountability among the IMF member countries. The originally set 2014 Code comprises of a set of principles built around three pillars: Fiscal Reporting, Fiscal Forecasting and Budgeting, Fiscal Risk Analysis and Management. Each pillar consists of a series of dimensions and principles that are to be followed. Fiscal Transparency Evaluations are assessing how country practices against the Code. They are carried out at the request of governments and form part of the IMF's policy dialogue and capacity-building efforts with its member countries. The Handbook consists of four chapters, providing an overview and basic information about the Fiscal Transparency Code and guiding the readers through the four pillars. Pillar I of the Code and Handbook is related to Fiscal Reporting which refers to the preparation and publication of summary information about the past and present state of a country's public finances. This pillar elaborates the dimensions of coverage of fiscal reports, frequency and timeliness of fiscal reports, quality of fiscal reports and their integrity. Fiscal reports should provide a comprehensive, relevant, timely, and reliable overview of the government's financial position and performance. Pillar II of the Code and Handbook provides a methodological framework for Fiscal Forecasting and Budgeting. Budgets and their underlying fiscal forecasts should provide a clear statement of the government's budgetary objectives and policy intentions, and comprehensive, timely, and credible projections of the evolution of the public finances. Pillar III is devoted to Fiscal Risk Analysis and Management, including a Fiscal Risk Management Toolkit. Fiscal risks are factors that may cause fiscal outcomes to deviate from expectations or forecasts. These factors comprise potential shocks to government revenues, expenditures, assets, or liabilities, which are not reflected in the government's fiscal forecasts or reports. As a first dimension, Risk Disclosure and Analysis invites governments to publish regular summary reports on risks to their fiscal prospects. The dimension of Risk Management lists the approach towards specific risks to public finances in terms of regular monitoring, disclosing and management. The dimension of Fiscal Coordination calls for fiscal relations and performance across the public sector to be analyzed, disclosed, and coordinated. 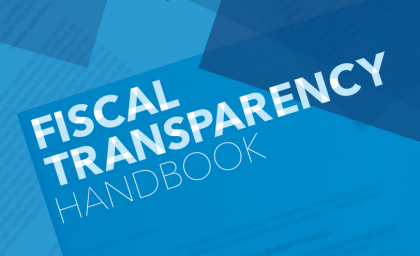 You can download the Fiscal Transparency Handbook here.